The bundt bakers are back today! A year ago, when I first joined the group and told Brian I was baking a bundt cake, he didn't seem too interested and informed me he prefers pie. But, oh, how times have changed and now bundt day is happily anticipated each month. Our theme for October was candy...and who wouldn't love that?! Still, I had a hard time deciding which one to use. So I narrowed it down to two of my favorite dessert treats, peanut butter and Nutella and decided to choose the candy accordingly. I asked Brian which one he preferred but he said they both sounded delicious and when was that cake going to be ready?? Ultimately, I was in a Nutella kind of mood and paired it with Ferrero Rocher chocolate hazelnut candies. And, don't worry, you may see that peanut butter option very soon. Enjoy! Using either a stand mixer or hand mixer, add the sugar and eggs to a large bowl and cream together for a couple of minutes until the eggs are a light golden color. Add the butter and beat until smooth. Add the vanilla and buttermilk and mix thoroughly. In a separate bowl, sift together the flour, baking powder, baking soda, cocoa powder and salt. Add the flour mixture into the wet batter and mix. Fold in the candy pieces. Butter and flour a 12 cup bundt pan and pour in the batter. Bake in a pre-heated 350 degree oven for 55 - 60 minutes, until a cake tester comes out clean. Allow to cool thoroughly before removing from the pan. To make the glaze, stir together the Nutella, powdered sugar and milk. When the cake has cooled and been removed from the pan, pour the glaze over the cake and sprinkle on the candies. Makes approximately 10 servings. Those little gold-wrapped balls just say holidays to me, Anita! How can you go wrong with the classic match of chocolate and hazelnut! That is one handsome Bundt! You used one of my favorite Italian candies and Nutella-the perfect bundt for me! :) Gorgeous addition to our Candilicious theme this month, Anita. 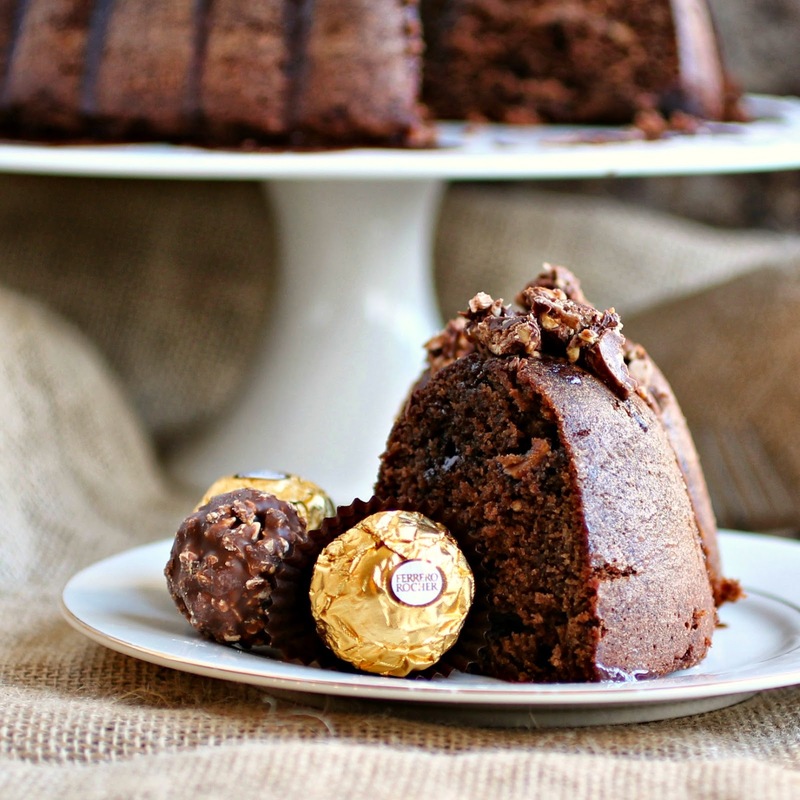 Those ferrero rocher are just a tease into what has got to be one delicious and decadent cake. Lol, such typical man answers Brian gives you! I love Ferrero Rochers, they will forever remind me of Christmas because back in the day, they were only available during the holidays instead of year round as it is now. This is one glorious bundt, Anita! Those hazelnut candies remind me of one of my childhood friends. Her dad would always bring them home for us. I'm totally making this cake the next time I visit her! I can imagine how wonderful this cake tastes. Delicious candy in a delicious cake.. YUMMY! 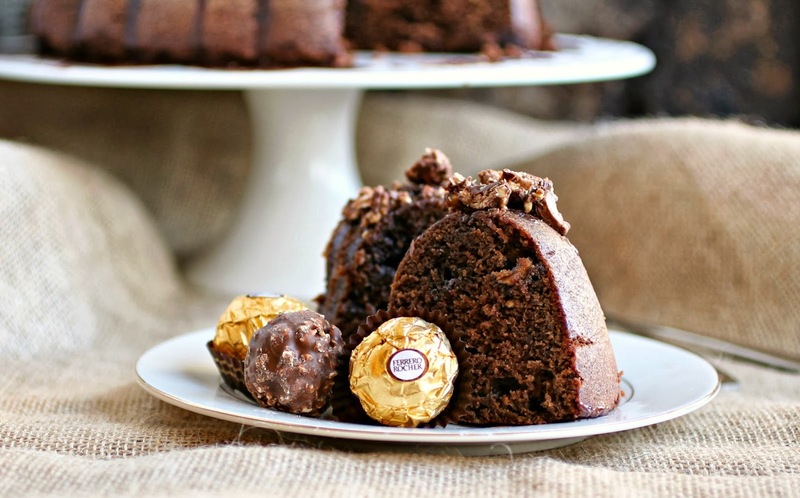 The ferrero rocher candies bring back holiday memories for me, what a special cake! LOVE Ferrero Rocher chocolate hazelnut candies!!! yumm! your bundt looks gorgeous and I love that your husband loves bundt-a-month now! so cute! One of my fav chocolate treats and I always get some in my stocking!!! Your bundt is gorgeous!! I am a big fan of Ferrero Rocher and always use them in my place setting at Thanksgiving - it's become kind of a tradition for my girls. I am sure they would love this bundt too. Love these candies! My daughter used to call them Ferrari's, I call them set your teeth on edge good. Especially in this cake! I love this and can't wait to try it! Just love this monthly party! 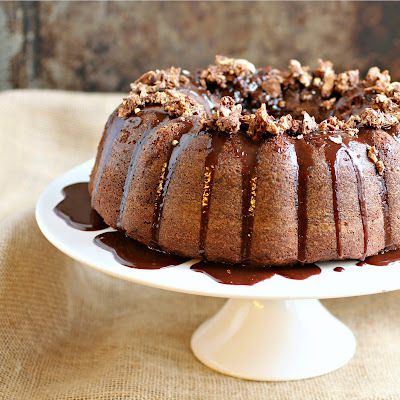 This bundt looks amazing! I can see why the husband gets excited. I would too! Oh my goodness, this cake sounds like pure decadence. Absolutely drool worthy! I love EVERYTHING about this. I'm in love. I made this and it was very dry. I am not sure why as I followed the instructions to the letter. I made it again, but used a cake mix and it was perfectly moist. I would love to hear your thoughts as to why the first one failed before I attempt it again. Thank you. Hi Michelle - I'm sorry you found the cake dry but I'm really puzzled as to how that could be. With 3 eggs and 2 sticks of butter to only 2 cups of flour, this cake is normally super moist. Is it possible that your oven runs a little hot? Perhaps try baking it for 5 minutes less. Another option is to bake at 325 instead of 350 and see if that solves the problem. I hope this helps! Hi Anita -Thank you very much for your reply. I am equally puzzled. No, my oven does not run hot. As I said, I baked two cakes and the one I used that had a cake mix was good and moist as my other cakes usually are. I will try this again because if this is normally moist as you have said then there must be something that I am missing; I don't give up easily! I used a scale to measure out one cup of butter in grams. I will use two sticks next time. Our butter reads 12% 8 grams of fat content. Does that sound like what you have been using? The butter I use is Breakstone's unsalted sticks. I looked it up and it has 11 grams of fat per serving (1 tablespoon = a serving) so it sounds like we've, hopefully, identified the problem. So, our butter's fat is similar since mine is at 12%. Did you use natural or Dutch process cocoa powder? I used natural cocoa powder because of the baking soda being present in the recipe. Natural was the correct choice. I would indicate in the recipe if Dutch process was required.